Elsa Mikus spent decades in the corporate world, working in what she describes as a ''dizzying array of jobs, ranging from file clerk to software tester.'' However, it's her most recent incarnation as an artisan that has brought her the most success and the greatest fulfillment. It took another decade of doing craft shows alongside her corporate job before she gave herself permission to pursue ''a more artful life;'' it was a decision that proved to be a godsend to her and Ryan, who had also spent years in less-than-satisfying corporate and teaching roles. Together, the two artisans now transform discarded pieces of silver into whimsical wind chimes and stunning pieces of jewelry. In addition to a flourishing wholesale business that sells their finished pieces to points all over the country, they sell through craft shows, home parties, their website (www.tempestinateapot.net), and out of a small store front located within Wickit Good Candles in Point Pleasant, New Jersey. The two artists also take on custom orders--personalizing the pieces to suit a client's taste or preference--and frequently complete custom orders that incorporate family heirlooms. 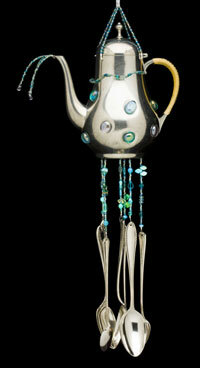 Their pieces, both standard and custom, begin at $25, but they can sell for as much as $200 for more elaborate designs. Mikus said she drew on a lifelong interest in jewelry to further hone her metal smithing skills through classes she took in 2009. ''I wanted to learn how to saw, solder, fuse, and a lot of other techniques needed to make jewelry look more professional,'' she says. That same year, the two launched a new line of jewelry that includes necklaces, bracelets, and rings from silver-plate flatware that dates back to the late 1800s. As with their wind chimes, many pieces also incorporate whimsy in the form of antique buttons, copper, brass, and handmade glass buttons. The fortuitous confluence of events that led to the launch of their business a decade ago involved good timing--a factor that is hard to overlook when considering success as an artisan. Friends of Ryan and Mikus decided that they, too, were taking a new path in life, and they wanted to pass along their acquired skills in metal-smithing, as well as their equipment. They offered to teach the two women their techniques, and both Ryan and Mikus embraced the new medium enthusiastically. They quickly evolved into accomplished artisans and began adding their own creative flourishes. 1 If possible, maintain physical separation between work and personal life. 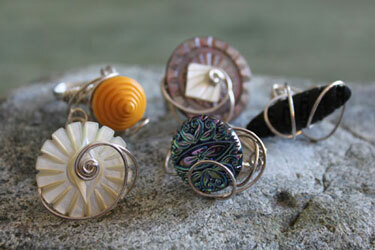 2 Take advantage of the opportunities to learn from fellow crafters. 3 Don't be afraid to change what you are doing. 4 Experiment with techniques that are popular with other crafts. 5 Adjust your business model to conform to economic realities. Following their explosive success at early retail craft shows, and a nudge of a fellow artist, the two women began doing wholesale in 2005.This venture proved to be so successful that they didn't need to do craft shows for five years. When the disposable income of so many buyers dried up during the economic downturn, the two got back on the craft show circuit, secured a retail store front, make sure their website is current, and look for every opportunity to gain exposure for their work.